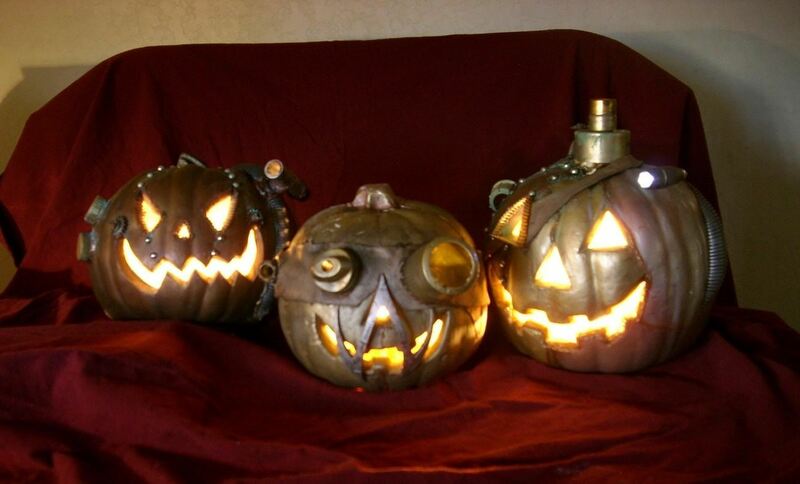 Since it's October and Halloween is fast approaching, it's time for a series of articles on how to make the coolest Steampunk Halloween decorations for your home! 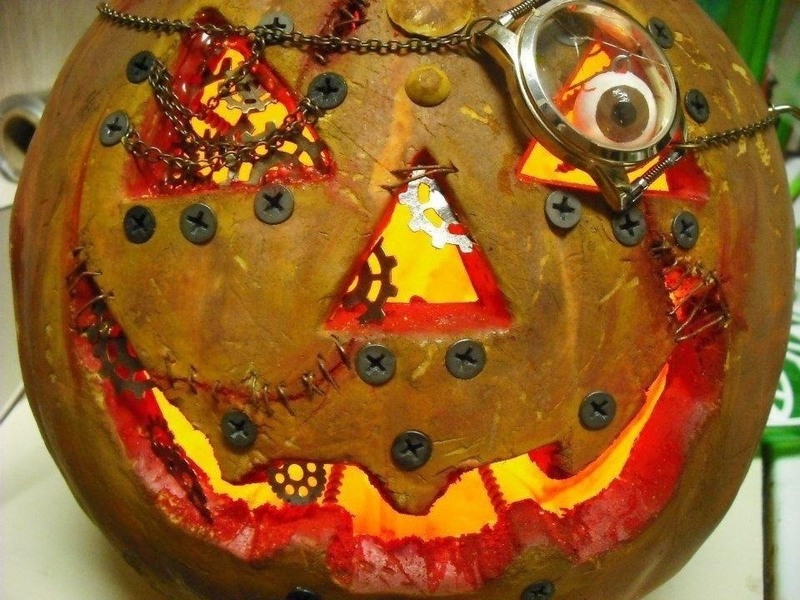 In this installment, we'll look at some jack-o'-lanterns, skulls, and a few other things that are easy to Steampunk, but will still keep that "spooky" Halloween feeling. 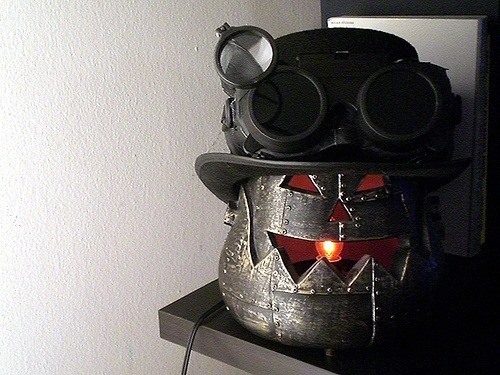 Jack-o'-lanterns are probably the single easiest Halloween decoration to Steampunk. I got the idea to do this post after I saw Phillip Church post one here on Steampunk R&D that he found, made by Dolli's Rust Factory. These three pumpkins below look like they were made with those fake pumpkins made of foam that you can buy in stores. 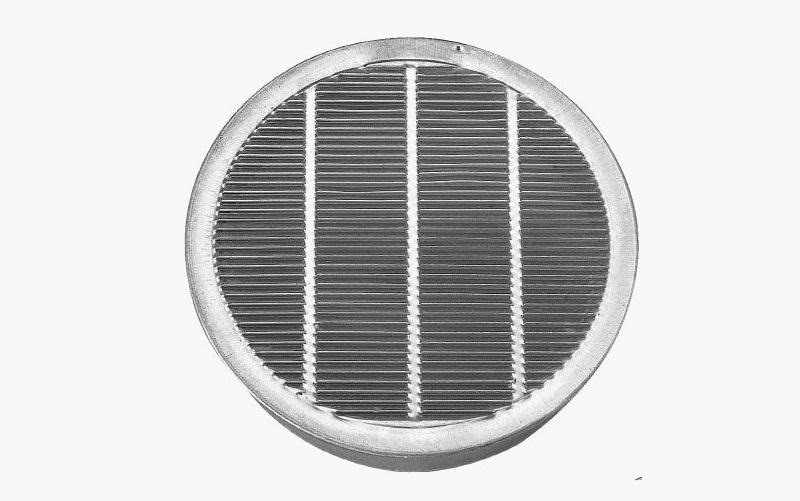 All that was really necessary to Steampunk these is some cool metal-looking bits and maybe a monocle or somesuch. I think they've also been spraypainted so that they'd look more metallic. This is a friendly-looking guy below, and he looks like he wasn't made of a real pumpkin, either, but from a bucket. I have no idea what's on his eyes, but that's the glory of Steampunk—taking everyday things out of their normal context and making them strange and exotic. I love this guy below, and I haven't the faintest idea what he's made of. However, the artist did a great job of making it look like he was made of joined metal plates. I'm sure you've seen a theme here, as far as metal jack-o'-lanterns go. It's an awesome smoke effect, except for one problem: the vapor is heavier than air, so it sinks. This means that unless you add a fan to blow the vapor up, you can't have it coming out of a smokestack for a steam-powered pumpkin. However, there are all kinds of ways to get creative when it comes to using dry ice. 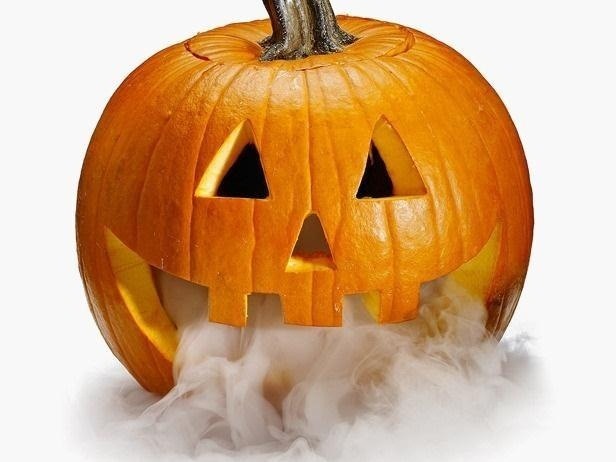 For example, you can put vents in the sides of your pumpkin so that it looks like smoke is coming out. Vapor coming out of something like these guys would be pretty awesome. They come in different sizes, too, so you can adjust them for your pumpkin. Later in the month, I'll do a tutorial just on jack-o'-lanterns, but for now it's time to move on! Skulls are pretty scary, right? Well, time to Steampunk them! 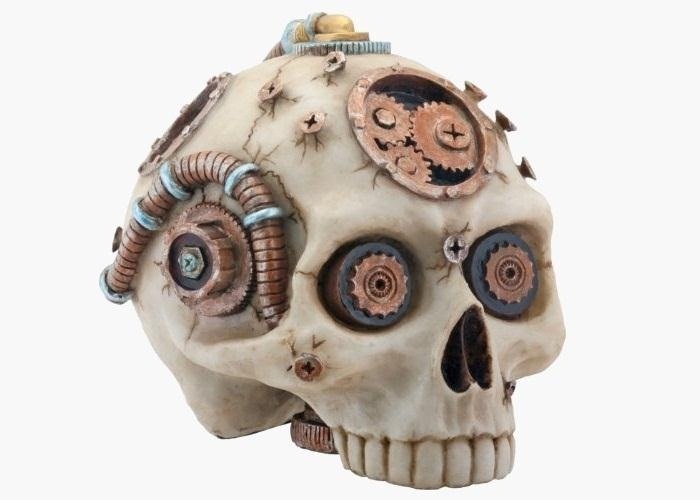 This piece below is awesome, and it would fit right in at a Steampunk haunted house. It actually looks as though this piece was casted, and is all one piece, but it was clearly molded from an original that really was made of all of those parts. 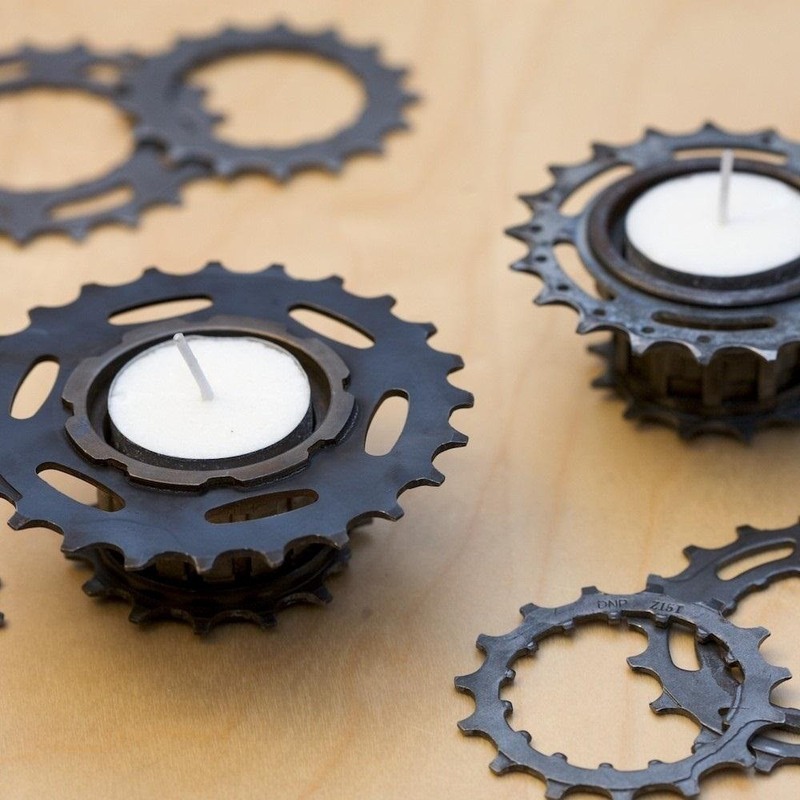 It shouldn't be that hard to replicate the idea using just various bits and pieces from the hardware store! It's amazing how similar this piece below is to the one above it, but this only hammers home the point of how easy it is. 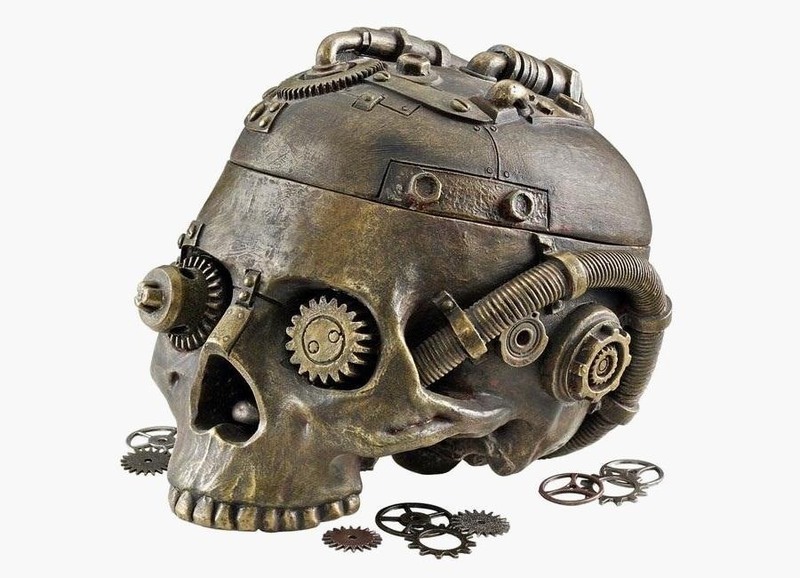 Plenty of fake skulls are available for sale at your local seasonal Halloween store right now, so if you just buy a fake skull, it should be easy to Steampunk it! If you need help on how to paint the skull so that it looks like it's made of metal, why don't you check out this article I wrote that has a step-by-step guide on how to do it! There are plenty of other things out there that go bump in the night, but spiders are terrifying because they're totally silent. 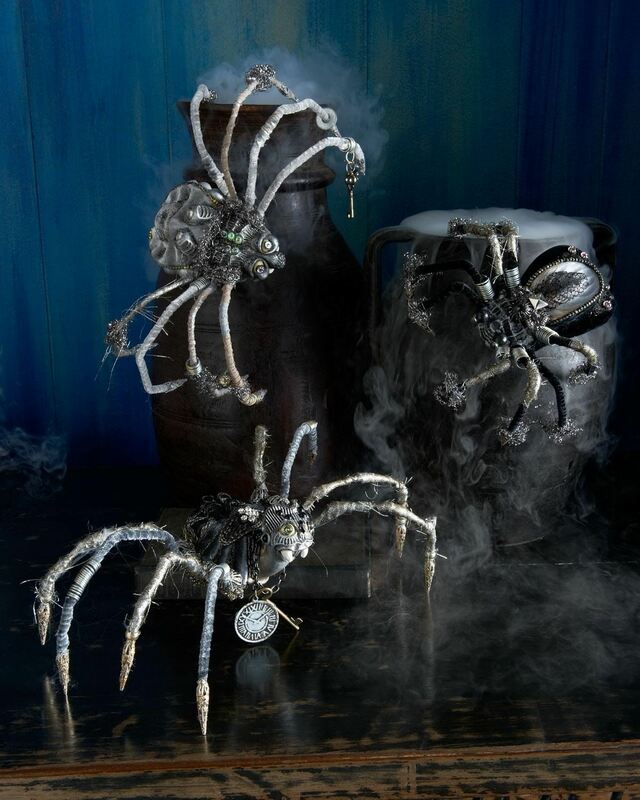 And what's better than a Steampunk spider? Three of them, that's what! 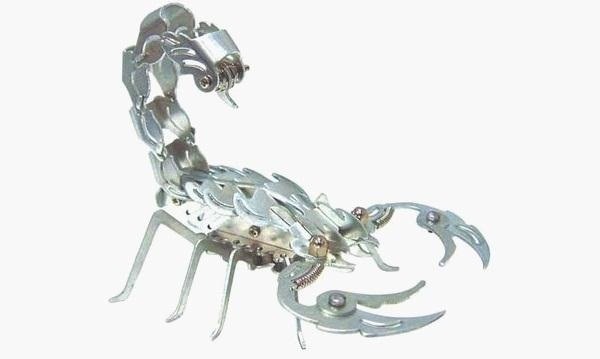 Okay, a metal scorpion might barely be better, depending on your preference. These guys are pretty cheap if you find them from the right place, and I've been wanting to collect an army of them for years, and bolt them to the walls and ceiling of my house. I'm going to do an article solely on lighting in the future, but for now, here's a really simple thing to do. 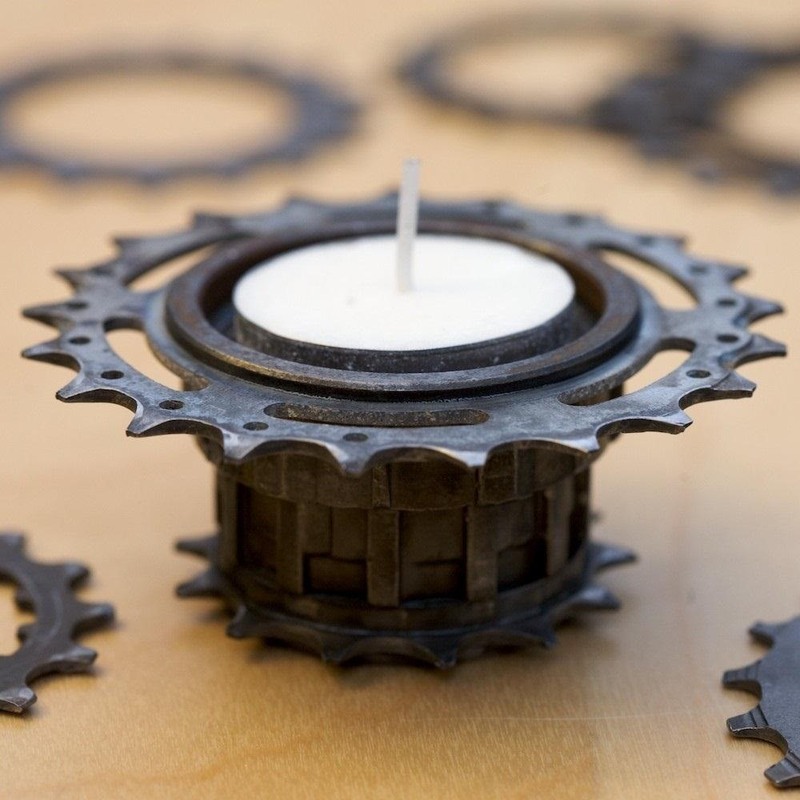 These are little tea light holders, and they've just been jazzed up with bicycle gears. A really simple mod to do at home! I hope that these ideas have inspired you, but this is just the start of the Halloween festivities this month, so check back for more! 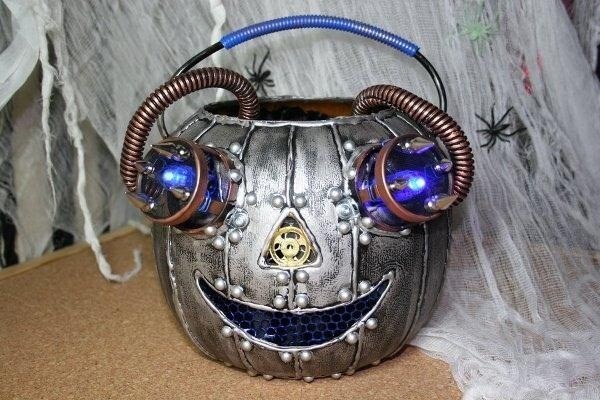 Steampunking a real pumpkin will only accelerate it rotting. The third - the bucket - I believe is found on Instructables, and the very nice sculpt in the 4th pick I believe is the creation of Steam Crow. Please make it so we can share on Pinterest or tell me how? Three years later, I see that my comment as Isher Creations has received two negatives votes. Not sure if that is because I sell these or some other reason. "Steampunking" an actual pumpkin as shown in the first part of the article is extremely temporary, as obviously the gourd will rot that much faster. It's not a very good way to go about adding steampunk to Halloween. Nevertheless, the cover photo was taken from my etsy store, as I create and sell these as Isher Creations, and the author linked to that shop. The next one down was actually commercially produced and for sale by Wal-Mart some years ago. No hat included though. I have tried to find the follow up "tutorial" promised, but have been unable to. I'm always interested in how different people approach the same problems.